What's In Your First Aid Kit? You'll want to have this specific spice in your kit at all times. Well it’s used to flavor your foods, it is in your spice rack. In ancient China and India, it is known as the spice from Heaven. Turmeric, turmeric, turmeric! You have all heard about the benefits of turmeric. If you are just hearing about turmeric, then let me share with you its many benefits. It’s anti-inflammatory, anti-tumor, anti-bacterial, anti-viral and has antioxidant properties. But did you know it can be used for bleeding? Yes, it can be used to help cuts stop bleeding. Turmeric powder is a fine dry powder. You can put turmeric directly on minor cuts and it causes the blood to clot almost instantly. Once you stop the bleeding, (the use of papaya and pineapple are excellent infection fighters). They can form a protective barrier on the wound and help speed up healing, thus helping in preventing infection. (Mashed papaya and raw pineapple helps speed the healing if applied to cut directly after the cut stops bleeding.) Leave on for 20 minutes and wash off, then cover with clean bandage. Change bandage regularly and keep wound clean and dry. You can’t keep fresh pineapple and papaya in your first add kit, but you can keep powdered turmeric in it. Another powder I recommend for your first aid kit is QR (Quick -Relief). You can purchase online, or look in your local stores. QR is a fine dry powder made from a mixture of potassium ferrate and a hydrophilic polymer and when it’s applied with a light pressure on the cut or wound, it can almost instantly stop bleeding. It also forms a protective seal over the bleeding wound that helps prevent infection. Mashed papaya pulp can be applied to minor burns as well. The pulp from the papaya contains proteolytic enzymes papain and chymopapain that aids the skin and the pulp has antimicrobial properties. So, if your first aid kit is bare, try these remedies for minor mishaps. 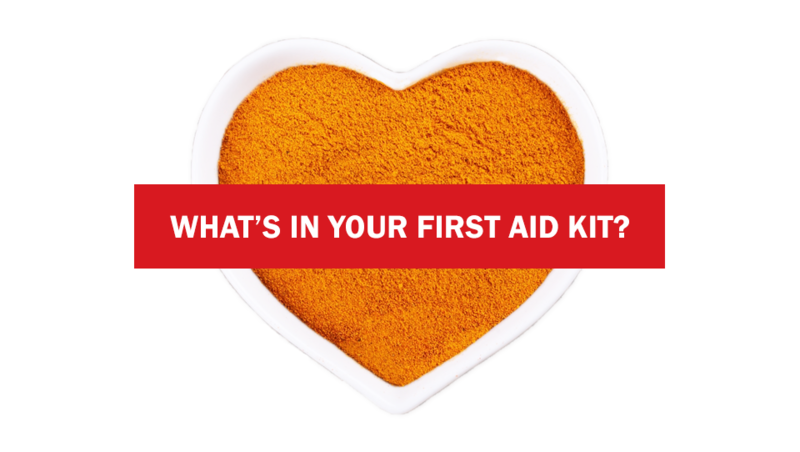 If you are stocking your first aid kit, then don’t forget to add turmeric powder or QR powder. All turmeric is not created equal. I suggest you purchase powders in a local health store, it may be slightly more expensive than your grocery store, but they are usually more concentrated and more reliable on its purity. If you only have turmeric capsules, (you take orally for inflammation), then that’s ok, too. You can open them and apply to the cut to stop the bleeding. Let it dissolve and stir in honey to your own personal taste. Till next time!!! And don’t forget to leave a comment below.